Vochelle is made from the finest ingredients and is in excellent condition when it leaves the factory. Chocolates are very sensitive to changes in temperature and humidity. This may cause the chocolate to show white spots and in some cases turn completely white. This is called fat bloom and is caused by the cocoa butter contained in the chocolate. Although this creates an unfavourable impression, it does not render the chocolates unfit for consumption. 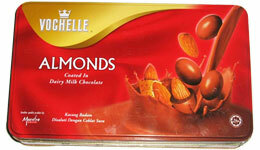 Whole almond nuts, hazelnuts and plump raisins covered in vochelle milk chocolate. Coated with Dairy Milk Chocolate.